This charming Ballet bed frame is finished in a striking white with gold highlights. 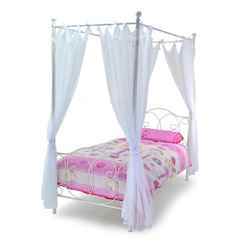 The four poster bed frame includes the drapes making it the perfect finish for a princess inspired bedroom. The frame also has a sprung slatted base, making it more comfortable to sleep on and mattress friendly.